Over the past two years, the content marketing world has continued to evolve as it takes stock of the seemingly endless string of new digital transformations. We have seen a continued emphasis on visual content through significant updates to almost every major social media/sharing platform - Facebook’s update to the Newsfeed algorithm thanks to the explosion of social video, Snapchat’s controversial redesign of its user interface, LinkedIn’s introduction of video content, Instagram’s surprisingly transparent explanation of how its algorithm works, and Twitter’s own timeline changes that make video more valuable than ever. There’s also the growth of Facebook’s Watch platform, IGTV, the increasingly robust data and creator tools available for YouTube advertisers, the monstrous growth of Amazon’s Twitch, and more. Our brains have been optimized for visual experiences. 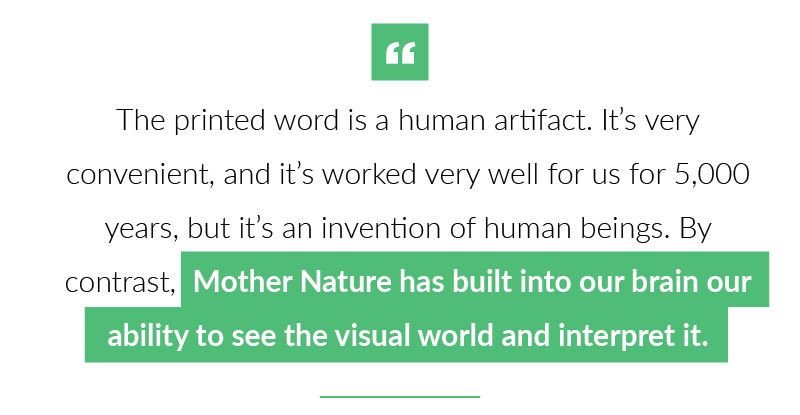 And while we, as a species, have evolved to add sophisticated language skills to compliment our visual abilities, physically reading printed text is not a natural experience for our brains. We look at the street as we drive, at the TV as we watch Netflix, at one another when we speak, at our phones as we scroll through Instagram. We constantly crave new visual stimulation. These cravings have increased as our brains to become hyper-optimized to absorb and decipher complex visual information in seconds. So how, as marketers, should we adjust to this constant need for visual stimulation? Visual content marketing is the answer. Visual content marketing uses graphics, images, and video to convey information in an engaging format and attract people to the information that’s important to their customer journey. This past year, Facebook changed its News Feed. The goal: prioritize the content shared by family and friends as well as content that sparks relevant and meaningful communication. Often, this is a picture or a video. What this means to marketers: pages now need to focus on producing more visual content that grabs their followers’ attention and leads to genuine engagement to remain in their feeds. Instagram also updated its algorithm to show more posts the app thinks users will “like.” It is based on past behavior to similar content and machine vision analyzing the actual content within the post. As pictures and videos receive more likes, the more likely they are to show up at the top of a follower’s feed. Instagram also implemented IGTV this past year to give businesses and influencers a way to post long-form videos and engage in new ways with followers. As marketers, understanding this ongoing shift toward visual is imperative, which is why first, we look to science. Vision and visual processing are two of the most researched areas of cognitive science, giving us insight into why humans are so receptive to pictures, videos, and other visual information and why it is a great way to interact with consumers. Human brains are made for visual processing. Visual content is easier to digest and retain. Combining relevant images with text increases how much your audience remembers by 650%. People remember 80% of what they see and do and only about 20% of what they read. 50-80% of the human brain is dedicated to visual processing such as vision, visual memory, colors, shapes, movement, patterns, spatial awareness, and image recollection. Visuals with color increase people's willingness to read a piece of content by 80%. Color differences between the content and the background enhance people’s ability to focus their attention on the content itself. People read colors advertisements 42% more often than non-colored advertisements. Our brain not only was made to but loves to be stimulated. If you hear a piece of information, three days later you will only remember 10%. By adding an image, recall can increase up to 65%. The average attention span of a human is 8 seconds, compared to a goldfish that is 9 seconds. When available, 59% of senior executives would rather watch a video than read text. Visual information is fast to consume. We can understand it in only an instant. Visuals are processed 60,000 times faster than text. It takes up to twice as long to process and recognize words. 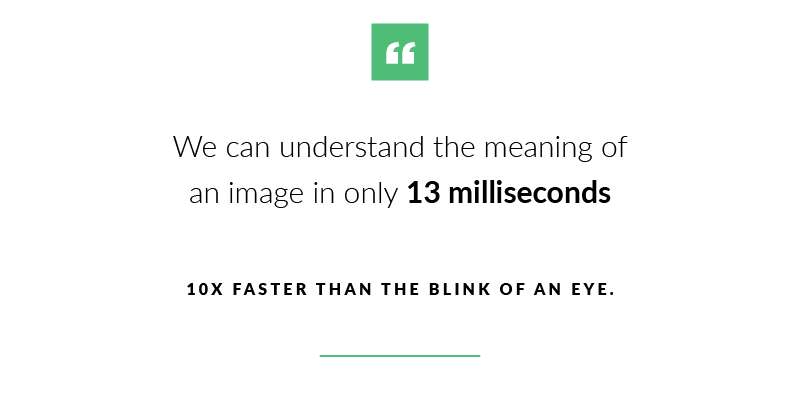 Studies suggest we are 10x faster at taking in image-related information. An MIT study published reports “we can understand the meaning of an image in only 13 milliseconds” -- 10x faster than the blink of an eye. The brain takes less than a second to process visuals; it takes 150 milliseconds to process an image and another 100 milliseconds to attach any meaning to it. We can remember up to 2,000 pictures with only a little learning. Why is this important for content marketing? With an overload of content affecting marketers across the web, especially within social media, you only have a split second to grab users’ attention. Research has shown using visuals with your content will not only captivate users’ but also lead to greater engagement on your social media. Increases brand recognition by up to 80%. Improves readership as much as 40%. Can be up to 85% of the reason people decide to buy your product or service. Facebook live videos have an engagement rate of 4.3% compared to 2.2% for non-live videos. Tweets with images get 150% more retweets, 89% more favorites, and 18% more clicks than without images. Social media users watch on average 1.5 hours of video content a day. Facebook posts from brands that include images earn 87% of all engagements on Facebook. Articles with an image every 75-100 words or so received double the social media shared articles with few pictures. Infographics can increase web traffic by up to 12% and are shared 3x more than any other type of content. Four times more people would rather watch a video review than read a product review. Customer testimonials with full-name and photo result in a 102.5% higher conversion. 78% of people watch online videos every week, and 55% watch every day. 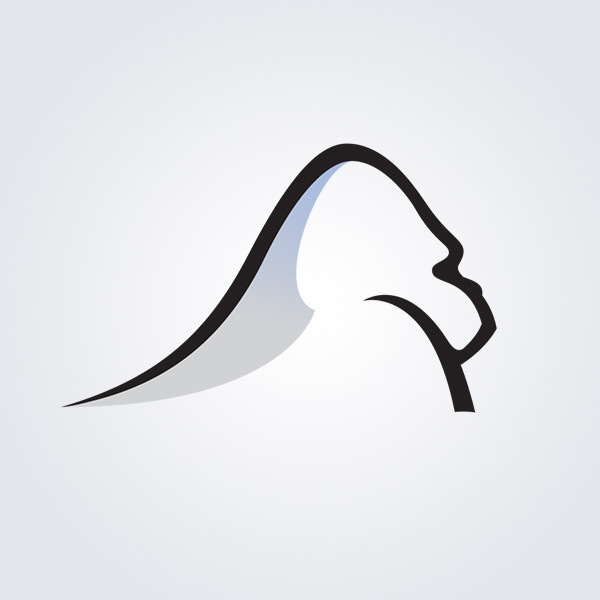 “In order to make data-driven decisions about what type of creative to use for campaigns,” says Silverback Strategies’ Senior Content Marketing Manager Courtney Voegele, “Our team will A/B test different variations. Although it can depend on the client or industry, we often see that video content garners more engagement than static images on social channels." Visuals, such as images, videos, infographics, etc., are unquestionably more appealing to consumers browsing the web, particularly social media. With the optimization of images and videos on the different social media platforms and our brains’ constant craving for visual stimulation, incorporating visual elements into your content marketing strategy gives you the opportunity to tap directly into consumer’s heads. This visual implementation not only will improve your views and following but will also help you attract the right kind of attention and boost engagement rates from your target audience.